When it comes to surviving Oregon’s notoriously dark and damp winters, mornings definitely find me protectively clinging to a steaming mug of full-bodied, locally-roasted coffee. But when warm weather rolls around, my solar-powered self craves something cooler (and less high-octane) to provide a light boost to my day. I’ve found a number of traditional and herbal iced tea recipes that often fit the bill, but when I really want to treat myself, I take the time to whip up a special treat: a chilled organic matcha tea latte. Matcha strikes an ideal balance between the energizing properties of your java fix and the bright, springy freshness of a green or herbal tea. Its lush and enlivening scent accents its bright, grassy flavor: a balance of umami, bittersweet, and smooth creaminess, especially when combined with dairy (or an alternative milk for a vegan matcha tea latte). A cup of matcha may contain roughly the same caffeine content per serving as coffee, but I personally have experienced its energizing effects to be less intense and jolting than those of my winter cups of joe. 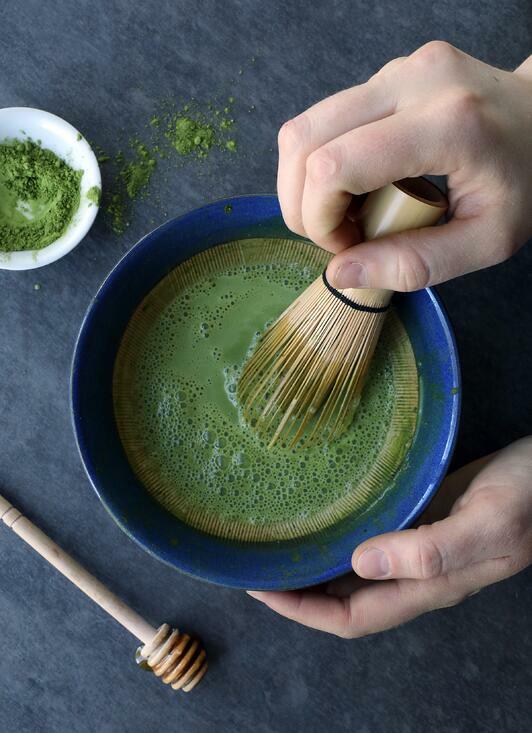 Sift organic matcha powder and organic lemongrass powder into a small, heat-safe tea mixing bowl (a traditional bamboo matcha spoon and mesh tea strainer work well for this; see our matcha making video tutorial for pro tips!). 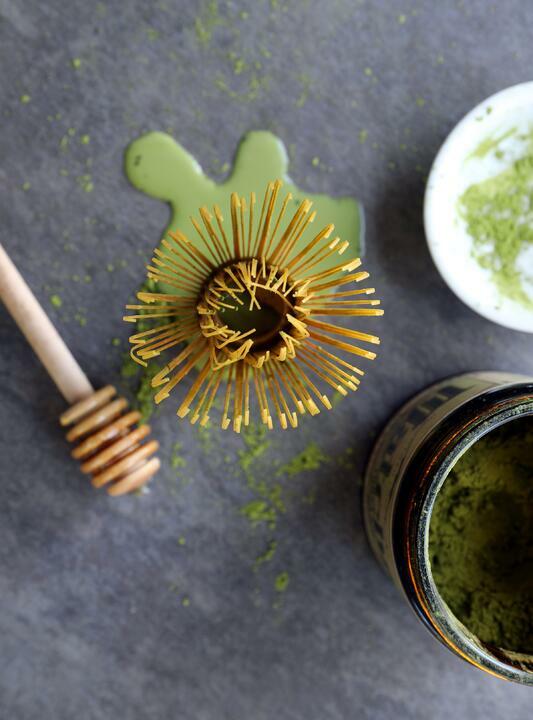 Gradually add water, and whisk to combine with powder in bowl (any whisk will do, but a traditional matcha whisk is specially shaped for this purpose). Once powder is completely incorporated (about 45 seconds), add honey (or alternative sweetener) to the warm liquid and whisk until dissolved. Gradually whisk in milk until texture is smooth and frothy. Pour over ice, let chill for a minute, and enjoy! We LOVE the traditional preparation for optimal smoothness, but if you need a quick and easy matcha latte recipe to take on-the-go, there’s a simplified version as well! Prepare in a half-pint jar with lid. Scoop organic matcha powder into jar, then add a few drops of water. Stir to form a paste, adding more water as needed (this prevents powder clumps). Add milk, honey or agave, and a couple ice cubes. Screw lid securely onto jar, then shake to mix. 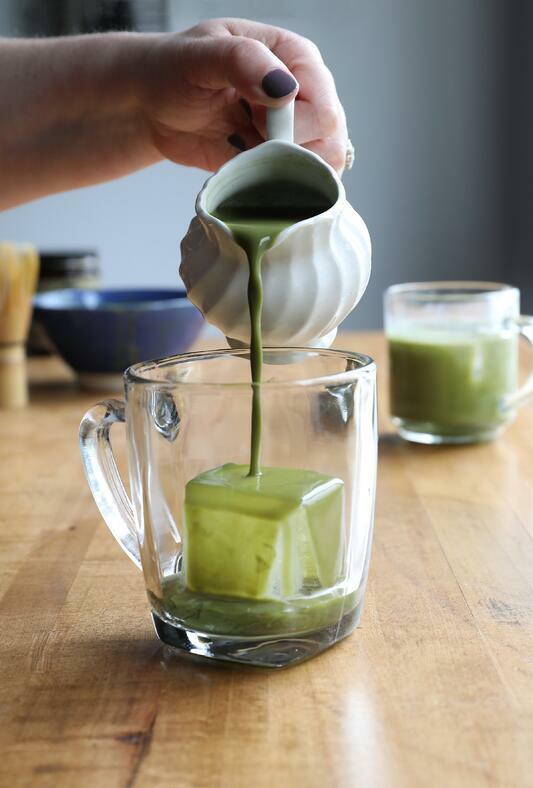 Wondering how to use matcha in Hot Tea? 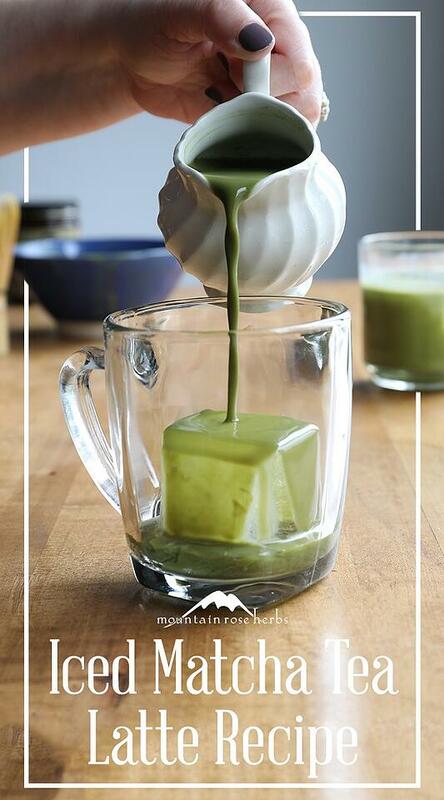 Watch Our Matcha Tea How-To Video! This blog post was originally published in 2014 as a part of our weekly series: The Sunday Steep.